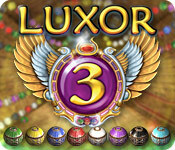 There are various ways of playing Luxor 3. You can match spheres here and there, hoping to make points and get cool stuff once in a while, but as the game gets harder, you'll likely need to add in some strategy into your gameplay. There is a logic when obtaining the power ups in Luxor and this guide will help you with some strategy tips. It took me some time to figure out how to get, for instance, a fireball (I love that one) every time I wanted one. So I started studying some patterns. It is simple enough. The goal in Luxor is to make matches with your own spheres and the ones lined up in a moving string. A match can be done when you hit a group of 2+ spheres with one of yours being of the same color. The Gods appreciate when you make several matches in a row and will reward you with a power up when you complete your 3rd match in a series. The matches may accumulate beyond 3 so you can get a power up after your 6th, 9th, 12th match, etc. But be careful, the number of matches will get reset 1) if you miss your shot and 2) if you have no other choice but to add spheres to singles on a string. At times I find it better to create pairs into a string before starting to eliminate spheres altogether, just so I can get many power ups in a short time. In the above screen it is possible to make 3 matches by hitting the black pair with a black sphere, then the red ones will collapse together and finally the blue ones will collapse as well. These blue spheres would constitute your 3rd match and a power up would be thrown in the air right after the match is made. Your job is then to catch it if you wish to use it. I hope this guide will help you to plan your powers and to have more fun in the game. Knowing these details helped me complete the "hard" quest with ease within a few days. I am confident that I will complete the "insane" quest almost as easily. It's not that I don't enjoy some challenge from time to time, but feeling frustrated because I can't finish a level is just too annoying. Have fun defeating Set!